If you’ve been following the buzz in search marketing these past few weeks, then you’ve likely heard the news about Google’s new suite of tools, Google my Business. Because of its rather apt and obvious name, you can probably guess that this Google’s new system to help ordinary Joes everywhere (observe: the lower-case M) organize and run their online marketing, all in one place. Gone is Google Places, useful at one time, but now shed like training wheels for this maturing search engine. In case you don’t remember, this was the little box in the top margins of your Google search results that listed your name, phone number, and a map to help find you, littered with a load of lettered red tabs that may or may not have had to do with your dealership. Things look little rosier now. All your SEO juice will be, um, concentrated in a clean, straightforward, and user-friendly platform. Look forward to posting general information, photos, and even include a virtual tour of the inside of your dealership, as well as automatically tracking website insights with these tools, such as clicks and new followers. That’s right—all your AdWords data, analytics statistics, SEO-boosting social media, and dealer videos in one place. 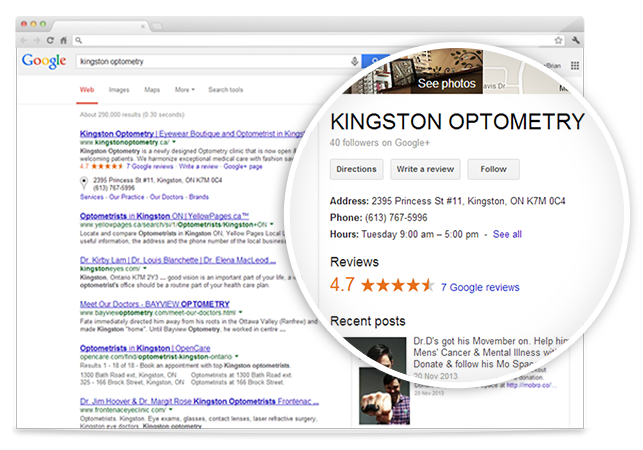 A: To get you higher visibility and “curb appeal” in Google searches, maps, and Google+. So make those dealership selfies extra chic! Perhaps the most welcome change of the bunch: all of your online reviews collected and compiled in one spot. 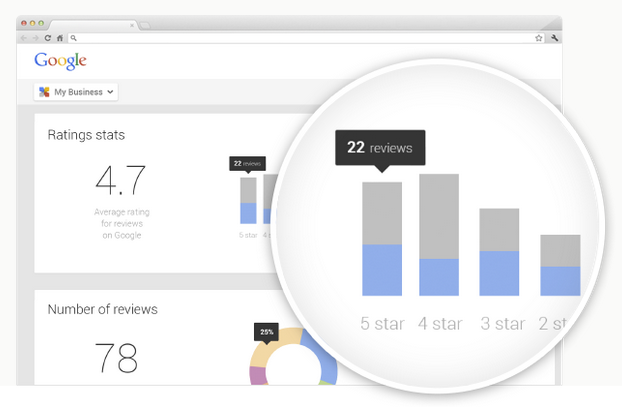 Save your marketing manager the time it takes to scan each and every entry from their bookmarked folder of online review sites, and have all of those linked reviews at your fingertips, instantly. We all know that reviews are time sensitive; you want to know what people are saying about you, when they are saying it. Not two or three days later. Turn slighted customers into happy ones, and have your happy ones post reviews on the third-party sites that people are actually following in your area. Yep, Google my Business lets you discover this, too. The Android app has just been released, and its iOS counterpart is not far behind; screenshots of both apps look promising so far. This means that not only can you manage your search marketing campaign at the office, but on the go, wherever you have access to your cellphone or tablet. Just don’t be obvious about it in the bathroom. You trust Strathcom Media to keep you up to date with the latest online automotive tech trends; trust us with Google my Business, too. If you have any questions, or if you need to be advised on setting up you Google my Business profile, contact your Strathcom representative and prevail in local search, today! Stay tuned for a post on How to use the new Google my Business. Google has been sending out “Action Required” emails to a test audience in Australia this month. They are giving certain local business owners 3 weeks to update their Google Places listings or the listings will be removed from Google maps entirely. We are making some changes to Google Places for Business and Google Maps so we can continue providing people with the best experience when they’re looking for local businesses. As part of this process, we’re asking business owners to review and confirm some of the information in their Google Places accounts so we can keep showing it to Google users. We know this will be a few extra steps for merchants, and we apologize for any inconvenience and thank you for your time. We have sent business owners affected by these changes an email entitled “Action Required: You have 3 weeks to save your Google Places Listing”. For those that have received this message, it’s very important that they log in to their Google Places account, update their business listing and ensure that all the information is correct. What does this mean for us Canadians? Today, SEO is no longer just about putting keywords into your website. A few years ago, no one was implementing SEO on their websites. It was easy to rank at the top of the Search Engine Result Pages (SERPS) just by doing a bit of keyword research, adding the keywords to your title tags, meta descriptions and website content and building some links. Things have changed. Google updates their algorithm constantly so that black hat and spammy SEO tactics won’t get you to the coveted spots at the top of the SERPs. Domain Authority affected by how long the domain has been active on the internet and how much traffic it receives. Individual Page Authority is how much traffic your individual landing pages receive. Should appear in footer of the website. This assures Google that you are a real brick and mortar business. Rich snippets are a few lines of text you can mark up on your website that show up directly in the search engine result pages. They are designed to give users more information about what the page is about before they click on the link. Citations are listings of your business contact information online (even if there isn’t an accompanying link to your website) and always include your address, phone number and other information about your business. You can add citations with your business information to a number of local and dealership directories. It’s important for Local SEO, as Google Maps often uses citation information to verify the correctness of its business listings. Google looks at the quantity and authority of citations for your business when determining your website’s page rank. The “NAP” in NAP Consistency stands for Name Address Phone Number. When your business is mentioned in citations, it is important that all of these elements are listed in a consistent manner. For example, you don’t want to call your business “Joe’s Volkswagens” in one place, and “Joe’s VWs” somewhere else. Refer to your business in one way and stick to it. If you refer to your business in different ways Google can see you as two separate businesses and this will split your authority in two. You want your business name to maintain as much authority on the internet as possible. Also be sure to display the same address and phone number in all places, as not doing this can split your authority up as well. For example, if in one-business listing your address is listed as 11420 First Street, and another lists it as 11420 1st Street, then Google could potentially see this as two separate addresses. Google robots are not humans; they can get confused if a business is referenced in different ways. It’s important to maintain your authority for one business and not spread authority across many different variations of your business name. Relevancy of links: is the link from a similar industry, or is it completely non-relevant? Is the business listing owner-verified? If a reviewer mentions a product in their review, you may start to rank for the mention. For example, if a number of reviews mention they bought a used Toyota at your Honda dealership, you may also start to rank for used Toyotas in smaller markets. Local Search is important for car dealerships in Canada because car dealers are local businesses – simple enough! A huge part of Local SEO is to claim and manage your Google+ place business listing; it’s even more important than your Apple Maps listing. Google Places accounts blend with the authority of your website and often appear above website listings directly in Search Engine Results Pages (SERPS). 1. Sign in to your Google Account or create an account for free at www.gmail.com. 3. Next you will see a map of your location and region with your business listed on the left-hand side of the page. 4. Click on your business name and a location box will appear on the map. 5. Click on “more info” in your location box. 8. Next, add in your business information. The more the better! The more information you provide Google, the better that Google robots will understand your business and rank you appropriately. 10. Adding pictures will ensure that the right images show up in your Google Place listings. If you don’t upload any pictures, Google may choose a random image from your website. Some dealers have had issues with used cars of different brands showing up as their main image. 11. You can also add YouTube videos directly to your account. 12. In the Additional Details section, you may add your dealership’s brands: Buick, Chevrolet, Honda, etc. 13. Once you have added all of your information, click Submit. In some cases there is only one option. The Phone option is usually the easiest. Once you have selected the option most convenient for you (or the only option available), a Google robot will send you a special code to validate your listing. If you select the phone option, your phone will ring immediately. Be sure to tell your receptionist to record the code the Google robot recites. If you select the text message option, you should receive a validation code on your cell phone. If you select the “postcard” option, you will receive a card in the mail in a couple weeks with the code. Make sure to tell whoever manages your dealership’s mail that this is NOT spam. Congratulations! Your listing should now be validated. Don’t forget to manage the page on a regular basis, add posts, images, and campaign your clients for reviews. Reviews on your Google Place account is a strong ranking factor. Managing your Google+ Place account on a regular basis can help you show up in a coveted spot in the SERPS. Is your car dealership visible on Apple Maps? A large percentage of the population uses smart phones to search for local services and products. While the most-used maps application is Google Maps, if you ignore the following Apple statistics you could be missing out on a big piece of the APPLE maps PIE. There will be an estimated One BILLION Apple devices active in the year 2015. Over 35% of Apple users use the default map application called Apple Maps. That’s 35% of a billion! Even without doing the math, we all know that that’s a lot of users. Car dealerships are local businesses, and this is why a dealership must focus on Local SEO. What is Local SEO? There are many aspects to Local SEO, and many steps to Local SEO one must perform to be successful. One important step is optimizing, claiming, managing and having accounts on map services online like Google Places and Apple Maps. Have a business Yelp Account. Since Yelp and Apple Maps are so closely correlated, just having a Yelp Account usually guarantees you will show up in Apple Maps. If your business has been verified on Yelp, there’s a good chance that it will show up on the maps. Open the Apple Maps app on an apple device. It means that Apple Maps does not have your business in its database or it’s confusing you with another dealership with a similar name in a different location. Select the page fold in the bottom right. Localeze is the core U.S. business listing data provider for Apple Maps. If you didn’t find your dealership in Apple Maps, you can check to see if your dealership is listed on Localeze.com. If not, you can submit your information to Localeze for free. That said, the free submissions can take a while to make it into the database. You don’ t want to be invisible on one of the most used Map applications in North America!